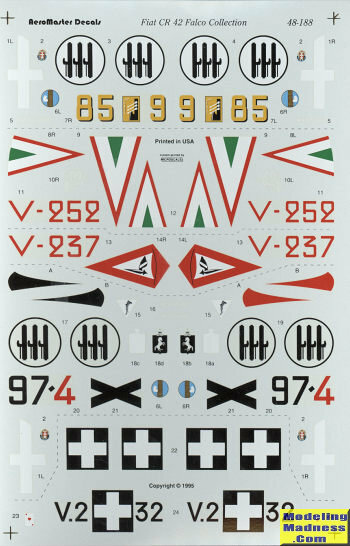 This sheet provides markings for five CR.42s. For the most part, Italian planes were a base color of sand over which there were mottles of dark green or dark green/brown with light grey undersides. Two Hungarian planes are in sand, dark green, and grey in a disruptive scheme. The upper wing camo slightly wraps under on the leading edge. For kits, nothing is specified, probably because the markings are not such that they require a certain kit to fit properly. At the time of printing, I am guessing that the Classic Airframes kit was all that was around. We have since had a very nice Italeri kit added to the mix so either of those would make for a nice model. First up is an 85 squadron plane that operated in Belgium during 1940 is a fairly disasterous Reggia Aeronautica outing. Yellow nose and fuselage bands. Next is a plane fro 97 squadron without any theater markings from Libya in 1941. Two different color spat markings are provided as the exact shade cannot be determined from photos. Third is a Hungarian plane with 1./4 squadron in 1941. This is in the prewar insignia, but has a large yellow fuselage band. The fourth is a plane from 1./3 squadron with the later markings. This has the red, white, and green tail markings that you'll need to paint on. It has the yellow eastern front markings on the fuselage, lower cowling and lower lower wing tips. The final scheme is also a Hungarian plane, but in standard Italian camouflage. It was with 2./4 squadron in early 1941 so has the early insignia.